If you’re considering shaving your head completely bald then you need the right razor for the job. The best razors for shaving the skull are different from those used to shave your face and chin. Why? because normal razors are usually stiff and do not move and glide with the contour of your head. So, to start off I always recommend you go for a cartridge razor with a swivel head, which will cost a few extra but is totally worth the money given that it will give you a cleaner and more comfortable shave. After all you don’t want to go out sporting a head full of cuts and bruises. Now let’s take a closer look at each one of them. HeadBlade looks like a toy car with a razor blade stuck to it which might sound bad, but in actual fact it does work! The great thing about this shaving gadget is that it is is super easy to use and helps take the guess work out of your head shaving routine which makes it idea for beginners. The HeadBlade however is by no means a tool for beginners only. Thanks to its glide system which uses small wheels that allow it to roll easily along the the skin you will get a safe but very clean and effective cut. It’s ideal for those early morning quick shaves in the shower when you’re still half asleep and don’t have the energy or the mindframe to think through an elaborate head shave session. The only downside I found for this product is that it’s quite small, so for those of you who have a larger frame and bulky hands, maneuvering this razor might be slightly tricky, especially if your hands are slippery with soap or shaving foam. Since the Head-Blade is quite a specific and unique product it has its own propriety detachable blades which you will need to replace, similar to a normal cartridge blade. So, if you decide to stick to this product you will have to buy its specific blades to replace them when they go dull. Also, another disadvantage of the headblade is that unlike other blades, this tool should strictly only be used on the head and will not be appropriate for shaving the face and chin, unlike regular cartridge blades which can be used practically anywhere on the body. The makers of this blade also have their own proprietary shaving gel, known as the Headslick which I would recommend you buy with the tool. It’s actually quite good as far as shaving gels go. So, if we’re talking strictly head shaving than the Headblade, as the name implies, is definitely worth an investment. Here’s a list of the pros and cons of this razor. Unique design which makes it extremely easy to shave your head. Provides an exceptionally close shave. Easy to change and replace the blades. 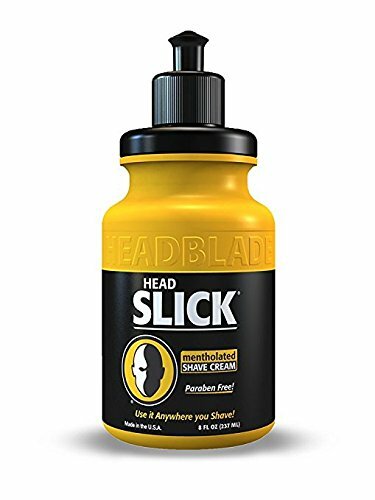 The HeadSlick shaving gel is outstanding. It’s designed specifically for shaving heads. Now, while some people may find it versatile enough to be used on other parts of the body we do recommend you stick to using it for your head shaving needs only. If you shave your head regularly then the Head-blade should be the right tool for you. We’re sure that once you master how to use this razor you will find it super handy and a must within your range shaving options. Another tool which was developed specifically for shaving your head is the Pitbull Gold Electric Shaver from Skull Shavers. This is a rotary shaver which will allow you to get a clean shave with ease and comfort and will get help you get done in the nick of time. Since this cordless machine can be used anywhere and it’s so easy and fast you can shave your head on a daily basis if you love that clean shaven look. So how is this machine made specifically for the head. Well, a typical rotary based electric shaver usually contains three rotating heads. The Bald Eagle on the other hand has five rotary heads which are situated in a curve like shape that will fit and glide perfectly to the curved shape of your head. You should get a clean shaven head in around 2 to 3 minutes. How’s that for efficiency? Since this is an electric machine, and a cordless one at that, as expected the price is higher than the other alternatives we mention in this post. Consider it as an investment. You’re paying to save time and for the comfort it provides. Also, even though the initial cost is much more expensive than cartridge razors, the upside is that you do not have to replace the rotary heads on a regular basis as you do with cartridge blades. This means that within a year you should recover the initial cost of the Bald Eagle when compared to other cartridge alternatives. Skull Shaver, the manufacturers offers also replacement parts for the machine, like rotary heads and batteries. Another benefit of this electric head shaver is that it can be used for both dry and wet shaving, which means you can decide whether to use it with shaving cream or directly on the skin. This cartridge razors gives one of the closest and efficient scalp shaves thanks to its flexible razor head. Thanks to its patented Flexball technology, this razor from Gillette does a fantastic job of getting to all the hairs, especially in these hard to reach places, like behind the ears and the rounded areas of the scalp. 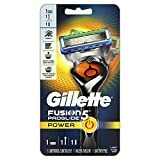 From my experience, the Gilette Pro-Fusion Flexball is all-round the best cartridge razor for the money. With sharp blades that easily cut through hair without any pulling and thanks to its easy glide engineered design it prevents (or minimises) skin irritation from shaving even if you tend to shave very often. The Flexball handle technology is comfortable and helps minimise nicks to the skin and irritation, since the blades will bend with the contours of your skin. Blades are very sharp and durable. You will be able to get more shaving sessions from one cartridge then most other cartridge razors. The front of the blades have a micro-fin feature which is designed to make your hairs stand up, thus allowing for a cleaner and more precise shave. Can be used for the head, face and any part of the body you’re interested in shaving. If you like to shave with a blade then there isn’t anything bad we could say about the Gilette ProFusion Razor. It may be slightly more expensive than other cartridge razors on the market however we really believe that it is worth the money you invest in this razor. also, thanks to its durability and long lasting blades we think it is even more economical in the long run. Now we’re moved onto a tool which should only be used by the more experienced shavers out there. So if you’re thinking of applying a safety razor to shave your head then, please, make sure you use extreme caution. Safety razors are the cheapest way to shave regularly since their blades are much, much more cheaper to replace then the regular cartridge razors. Having said this, the responsibility of getting a safe, clean shave lies entirely on you when using these types of razors because they do not have any of the technology and modern engineering design of the latest cartridge head razors. So, whenever you shave with a safety razor you need to be alert and know what you’re doing at all time. When using a double edge safety razor (DE razor), you need to hold the blade at a 30 degree angle to achieve an than effective shave. On the other hand cartridge razors are already designed at this angle. As you can imagine, using a safety razor to shave your face is one thing, but using it on your head is much trickier since you are tackling a rounded sphere and you cannot directly see most of the parts you are shaving. This means there is a bigger chance that you will nicking yourself in various places. As far as brands go, if you’re up for using a DE safety razor then we would recommend the Merkur 34C. This German made DE safety razor offers a long handle (4 inches in length) which is ideal for a grip and handling, but also allows for the perfect support and balance. This is also great for those of you who have large man hands! The handle also comes with non-slip grip which keeps the razor firmly secured in your hands even in wet, soapy and slippery conditions. That’s essential when dealing with tricky shaving areas. Whether you are using a cartridge, double edge razor, and to some extent a electric shaver, a quality shaving cream can make a world of difference. Apart from reducing nicks and cuts a good shaving cream will help avoid scalp itchiness and dryness. Remember that when you shave your head bald you are effectively exfoliating your scalp which can lead to dryness. We therefore recommend the use of a shaving cream which contains the necessary oils the give you an efficient and close shave but which also leaves your skin hydrated. Our favorite shaving cream is the Taylor of Old Bond Street. We also recommend you use a badger brush (shaving brush) to apply the cream on your skin. This allows the cream to penetrate more deeply under the hairs and thus allows for a better shave overall. Finally, apply a dash of aftershave balm on your scalp when you’re finished from the shaving process. This will reduce that post shave irritation and soothes the skin to provide relief and freshness to your head. The aftershave balm will close up your pores and prevent acne or infections. Just to be clear the balm will not leave you with a shiny head. Nobody wants that. If you rub the balm carefully on your head, the oils from the after shave balm will dissipate in about 15 minutes. So, those are our recommendations for shaving your head completely bald. We’ve seen the best razors for shaving heads and also added a few other follow up options to make sure you keep your scalp looking good and healthy. If you want a close, clean shave that will hit all the tough to reach areas of your head then you should go for the Gillette ProFusion with the FlexBall. On the other hand, if efficiency and convenience is more important for your daily routine then maybe Skull’s Bald Eagle electric shaver is your best choice.